Fenugreek is one of mankind’s oldest medicinal plants with its roots in North Africa and Mediterranean area but with widely grown in many parts of the world today.Fenugreek seeds often referred to as methi seeds in Indian context belongs to Fabaceae family and is widely used a both an herb and a spice. Fenugreek is considered as a wonder herb and a great boon to mankind as it is a healthy supplement rich in protein, calcium, phosphorus and iron in their natural forms and vitamin contents. While the sprouts and leaves are eaten as vegetables, it the most commonly used ingredient in preparing pickles, curries and pastes in Indian households. The dried leaves of fenugreek are referred to as kasuri methi which is primarily used for cooking and garnishing in various cuisines. Fenugreek seeds are known to help lactating mothers by increasing milk supply. Relief from arthritis pain can be sought by having a cup of tea made from fenugreek leaves.Traditional Chinese medicine uses fenugreek seeds for tonifying and warming kidneys, alleviating pain and dispersing cold.A fenugreek seed, owing to its anti diabetic properties serves as a ray of hope for diabetics as they have been tested to bring down the blood glucose levels in the body and improves glucose tolerance.Fenugreek tea provides relief from kidney stones and is used in flushing the kidneys. The presence of lecithin, which is the most important nutrient for brain in fenugreek, makes it useful for increasing memory power.Eating a spoonful of fenugreek seeds acts an antidote to fatigue, back aches and other body aches. It is an age old tried and tested remedy for relieving pain.Naturopaths have ascertained the fact that diabetic patients can benefit immensely by eating a tea spoon of methi seeds or drinking juice of methi eeds first thing in the morning. Fenugreek in a meal is known to lower cholesterol levels thereby lowering the risk of heart attacks and strokes.In short,fenugreek is a common medicine for all bodily ailments. Premature graying of hair can be avoided by massaging scalp with methi seeds powder mixed with coconut oil, leaving it overnight and washing of with cold water the next day.Massaging scalp with methi leaves paste mixed in coconut oil helps in promoting hair growth, preventing hair loss, preserving the natural hair color and making the hair texture smooth and silky soft.Paste of methi leaves mixed with vinegar helps in treating dandruff. 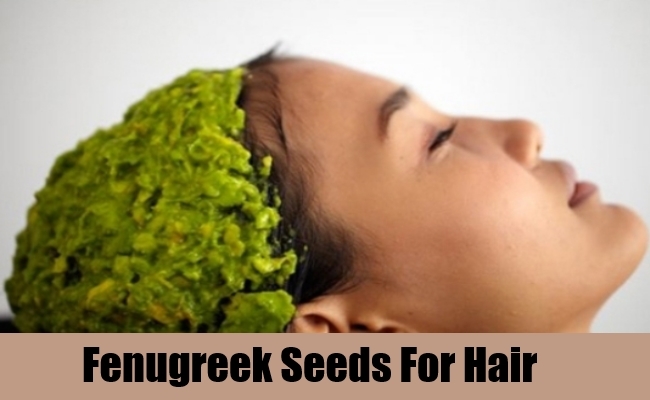 Fenugreek acts as a natural hair conditioner. For treating pimples and blackhead prone skin,paste of fenugreek leaves mixed with turmeric can be applied on the face. Applying paste of fenugreek leaves mixed in boiled milk to the face helps in delaying then appearance of fine lines and wrinkles.This paste not only helps in improving complexion but also makes one look younger. Fenugreek is undoubtedly the most widely cultivated medicinal plants with wide usage in various forms across culinary, medicine and beauty aid.